HomeInspireSlain In the Spirit: Is It A Biblical Practice? Are there valid biblical references for such an experience? Have those who have been “slain” become better believers with changed lives and reverence for the Word? Or have they merely placed greater emphasis on supernatural experience over objective truth? Being ‘Slain in the Spirit’ is a phenomenon that occurs in some charismatic churches. Some Christians believe that when God’s presence is so strong, we can be overcome by the Holy Spirit, lose control, fall to the ground and become incapacitated for a while. This may happen in a meeting where there is an atmosphere of heightened expectation after a considerable period of worship and preaching. Then the speaker invites members to come forward to be prayed for. Often he or she might touch the forehead of believers to “impart the anointing”. Some believers fall backwards—‘slain in the spirit’. Attendants or “catchers” stand behind believers to cushion their fall. One of the favourite passages used to support this practice is found in 2 Chronicles 5:13-14, where the glory of God descended upon the house of God as the people worshipped. The priests were unable to continue ministering because of the overpowering presence of God. There is no mention of them falling backwards. However, falling under God’s presence in scripture is often related to adoration or worship. Awed by God’s presence, believers fell on their faces, not backwards (Ezekiel 3:23, Matthew 17: 5-6). But they did not lose control of their faculties. It is a spontaneous, conscious act of worship. The catch is there are no “catchers” behind ready to cushion their fall. “As the appearance of the rainbow in the clouds on a rainy day, so was the appearance of the surrounding radiance. Such was the appearance of the likeness of the glory of the LORD. And when I saw it, I fell on my faceand heard a voice speaking” (Ezekiel 1:28). “Then I heard the sound of his words, and as I heard the sound of his words, I fell on my facein deep sleep with my face to the ground” (Daniel 10:9). “When I saw Him, I fell at His feetlike a dead man. And He placed His right hand on me, saying, “Do not be afraid; I am the first and the last” (Revelation 1:17). When the men, led by Judas, wanted to arrest Jesus, they had to identify Him first. At Jesus’ voice, “I am He”, they fell backwards (John18: 3-6). But this is an act of judgment on evil men, unrelated to believers coming under God’s power. A clear reference to being ‘slain in the spirit’ is found in the chilling account of Ananias (Hebrew, ‘the Lord is gracious’) and Sapphira (Aramaic, ‘beautiful’) in Acts 5:1-11. They were slain—physically and literally. But this was negative—an act of swift judgment on God’s part, not an act of falling backwards under the favour and power of the Holy Spirit. Some say that, in light of John 21:25, not every miracle can be recorded. But this is an extremely weak reason to use in support of a practice that is widely accepted in charismatic circles. That said, God can still work miracles today (John 14:12, Ephesians 3:20) and we should not put Him into a box like what cessationists would like to do. God can work in wondrous and diverse ways that blow our minds as even the shadow of Peter and the handkerchief blessed by Paul had healing properties. So we should not limit the workings of an infinite and a limitless God, just because we have not experienced something miraculous. Even so, this phenomenon of being slain in the spirit does not have any clear scriptural support. We should not try to show we are anointed—like pushing a believer down—as He is sovereign and can choose when to act and when not to. We must always be aware of the corruption and weakness of the flesh. Both ministers and believers on the receiving end can be equally guilty of faking the experience to appear good before men. The danger of deception must be stressed—transmission of strange spirits through the laying on of hands, especially by visiting speakers, whose background of involvement with the occult cannot be ascertained. If this ‘slain in the spirit’ phenomenon is not clearly mentioned in scripture, why are so many charismatic believers coming forward, eager to be “slain”, at meetings held by illustrious speakers? Is it because they are spiritually dry and want to experience God’s power, favour or presence? If there is no precedent in scripture, could we be opening ourselves to autosuggestion, self-deception or possible deception by strange spirits when we seek to be slain in the spirit? Have we asked ourselves whether we have been manipulated by the following? a mindset that tells us, since others are “slain”, we must not be left out; otherwise we may be deemed as having hard hearts (peer pressure)? Every believer can come into God’s presence in the quietness of their own prayer closet (Hebrews 4: 14-16, Matthew 6:6). Though we acknowledge the power of ministry through anointed servants of God, believers need not necessarily run after special meetings in order to be ‘slain in the spirit’. Our own daily personal devotion is more powerful. 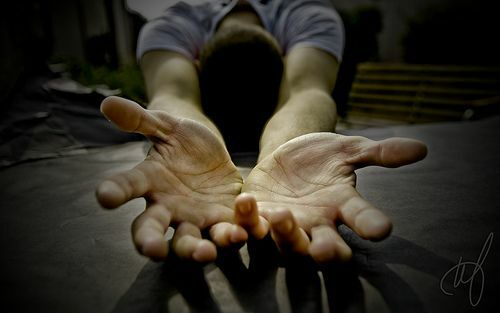 Rather than choosing to run to meetings where we can get zapped—‘slain in the Spirit’—we should seek God ourselves: Bow down, fall down on our knees or fall on our faces as an act of worship and adoration. To be fair, nothing is amiss if believers allow a minister to lay hands and pray for them. But let us leave the results to God and not turn this ‘slain in the spirit’ phenomenon into the “must have” thing for spirituality, the ultimate sign that we have God’s favour and power. Do not forget that after we come down from the ecstatic, mountain top spiritual experience, we still have to face the day-to-day battles in the valley. The choice is ours, whether we want to follow the teachings and practices of man, or rethink this common charismatic practice in light of scripture. With special thanks to the author, Kevin Reeves, and Lighthouse Trails Research for the above link. Do not forget to read all the comments accompanying the video. SHOULD WE EMPHASISE EXPERIENCE, DOWNPLAY DOCTRINE? Some church leaders seem to support this premise: “Experientialism is the way to go; experience it and you will come to know the truth.” Do you think the preceding statement is valid? Is it true that the proof of the pudding is in the eating? Nothing like trying, isn’t it? Don’t we sing, O taste and see that the Lord is good? SHOULD WE RUN AFTER SIGNS AND WONDERS? Is there a rationale for pursuing signs and wonders? The battle that has been raging for centuries: Should believers emphasise the Word or Holy Spirit more? Some believers ground themselves so strongly in the Word that the Holy Spirit has little relevance in their lives. They become wary of spiritual gifts or “being led by the Spirit”, thinking that by doing so they may be opening themselves to self-deception and counterfeit spirits of darkness. So they reason it’s better to play it safe by staying in familiar territory.